Qais Essar’s latest album The Ghost You Love Most dropped this week. The dawn of Qais Essar’s third album is a blossoming, a “coming into.” For his first two albums, Tavern of Ruin and I am Afghan, Afghani is Currency, Essar was sowing his keep among prolific musicians. This time around, listeners are gifted a sonic lotus: sharp, full, meticulously layered, and breathtaking against the backdrop of a muddied and cracked world. 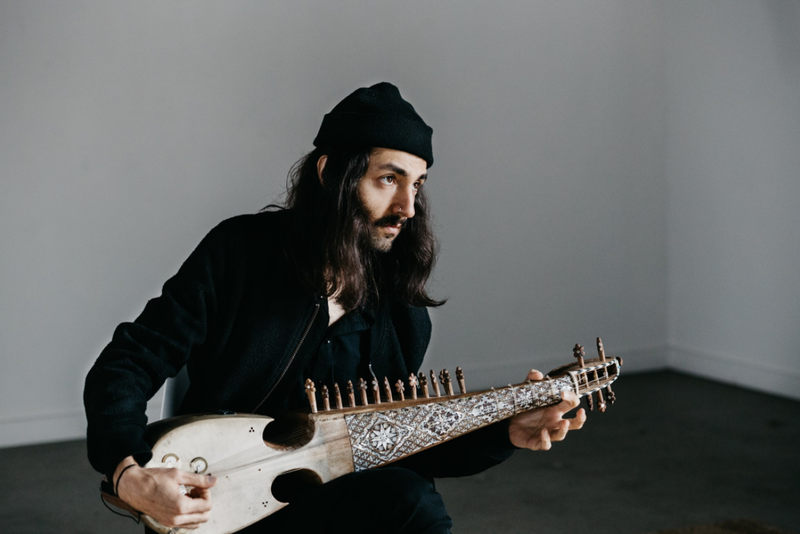 Essar’s pieces have a duality to them, one that is reflective of his identity as an Afghan-American, but he says the word “fusion” does not accurately describe his music. Essar’s compositions are born and curated out of raags he has practiced his entire life, while contemporary techniques further shape the way the music rises. The sound is distinctly Eastern, and yet it would not be complete without contemporary detailing, moving Essar into a tier of visionaries. “This time, I wrote a lot of the chord progressions first. I’d be lying in bed in the morning. I had a banjo and I would come up with chord progressions. I would sing some melody on top of them, and that’s how a lot of this was formed. I’m using everything I have at this point,” he said. Think of Michelangelo’s works. They exemplified the finest classical stylings of his era, immortalized into the present day. Yet, Michelangelo distinguished himself by capitalizing on the language of mischief, sexuality, and emotionality overlain on his paintings, poetry, and architectural pieces. He followed his creative capabilities, sometimes in secrecy. He sat in the knowledge of artists: reality is but perception. Telling this truth is an endeavor of tenacity. This is an obvious quality about Essar and his music. “This album is sort of like Bowie’s productions, like when he was Ziggy Stardust. This is reminiscent of that kind of conceptual work built around a strong narrative. It makes it bigger. The premise of the new album is a story that starts at the end of what is a very long sad and sorrowful life, of a person passing,” he said. This album is also studded with star power, featuring Thierry Amar (from Godspeed You! Black Emperor) on bass, Justin Gray on bass veena, Kamaljeet Alhuwalia on santoor, and Sheela Bringi on harp. The first track, “The Culmination of a Sorrowful Life,” is a springboard for the protagonist’s journey after passing, a quest for what was unsolved and unanswered in life. The protagonist is a person who begins their journey as a ghost in search of what they could not find in their material life. “They set off into the land of jinn. I pulled this out of Islamic and Persian lore. There’s this concept of a place called ‘Qaf.’ In Qaf, there’s a mountain made of emerald. At the top of this mountain, there’s this tree of life. And at the top of this tree of life, there is a simurgh, or a [phoenix-like creature]. It’s the source of all the answers and knowledge of the universe…this one thing that could possibly hold whatever answers [the protagonist is] looking for,” Essar explained. The track names are denoted by their significance to the plot line, like “Journey to Qaf” and “The Simurgh.” The story builds until the meeting with the simurgh and there’s a comfort you can hear. Each track is like a chapter in a book, and Essar is the novelist. But he wasn’t able to write the concluding chapter. The last track is untitled. It tidals out like ripples on a shore, serving as reprieve. Essar is releasing this album after a luminous year. His song, “The Crown Sleeps,” for the Golden Globe and Oscar-nominated animated film The Breadwinner (produced by Angelina Jolie) won a Canadian Screen Award for “Achievement in Music – Best Original Song.” The song was also shortlisted for an Oscar, placing Essar in the league of artists like Pharrell Williams. The movie is based on the children’s novel and one of the first to feature a young, Afghan female protagonist. For Essar, it was project that symbolized the humanization of Afghan families and people. “I don’t think [Afghanistan] is as imaginary as it once was. It’s now America’s longest war. People are having to come to terms with this place that is very much real. A lot of people would hear of Afghanistan and they would be like, ‘Narnia!’ No one was really invested in this place. The film places it in a non usual light. What’s the usual light? Assholes at war. War, or war, or war. So it’s good to get a more whole perspective,” he said. Essar’s compositions suspend listeners into the reality of what can and has been imagined, highlighting the salient ephemera that make up life in its first and final forms. This album examines what happens even beyond that, blurring the lines of time imposed on the soul’s journey. Put down your audiobook and pick up this album. Listen to and buy The Ghost You Love Most on Qais Essar’s website.